After watching a screening of Antichrist, actor Willem Dafoe talked about the film and director Lars von Trier’s motivations. During the course of this brief Q&A, some light was shed on the inclusion of a dedication to Andrei Tarkovsky, the legendary Russian filmmaker. The film itself was a very personal tale for von Trier, written and created to exorcise his demons and, according to Dafoe, was influenced in part by the Russian’s Zerkalo [The Mirror]. Von Trier only had one request before filming Antichrist and that was for his lead actor to watch this dreamlike meditation on memories, life, and death. Upon seeing it for myself, the first work by Tarkovsky I have viewed, despite Solaris collecting dust on my shelf, I can see the correlations. Besides the subject matter of both being deeply personal, it is the aesthetic utilized that resonates the most. Watching the deliberate camera movements, the shots of foliage being pushed by wind, the slomotion sequences, and the switching from black and white to color all recalled von Trier’s harrowingly cryptic tale. I do think, however, that the fact The Mirror has no real plot, nor attempts to have one, makes it the better film, allowing the audience to bask in the puzzle and try to piece together the scenes into a snapshot of its author rather than a narrative needing deciphering. Tarkovsky deliberately makes his audience unbalanced right from the get-go. It all starts with a “miracle worker” taking the tension away from a stuttering boy on television with her words and hands. What one may not catch, nor remember, is that the set is turned on by Ignat Daniltesev, the young actor playing, our stand-in for the director himself, Aleksei. What makes it even more complicated, however, is that Daniltesev also plays Ignat, the son of the grown up Aleksei, a boy being raised by his mother after his parents’ divorce. And the mother, played by Margarita Terekhova, is doubled up as well with the actress also playing Aleksei’s mother back in 1935. So, the confusion of who is who at any given time can only be solved from the dialogue at hand, hopefully talking about a character that exists in one time period rather than the other. One might think you could tell the difference by acknowledging the past as being shot in black and white while the present/future is displayed in color. Unfortunately, though, after this appears to be the case, the formats are switched, adding just one more “mirroring” effect to recall the film’s very appropriate title. There, of course, is even more going on than a disjointed composition of short vignettes. We have a narrator talking about the Russian countryside as well as a series of poems, (written and recited by Tarkovsky’s own father), loaming over certain sequences. What results is a sort of sketchbook or diary of Aleksei’s life, showing us moments during his adolescence as well as the disintegrating relationships his current self has wrought. When the adult version—whom we never see—talks about his dreams and visions of years past, he speaks to his ex-wife about how his mother always appears to look like her. Here is one line of dialogue that throws the entire film into chaos, basically positing the idea that every time we see his mother could in fact be a dreamed memory, possibly completely false or misremembered in his mind. Therefore, what is true? Is anything true? Frankly, there is no way of knowing, or reason to. Instead, Tarkovsky has decided to just flash moments one right after the other, filling his audience members with raw data, at times even splicing in lengthy sequences of historical war-time footage, to be pieced together and interpreted any way they wish. The Mirror is more an exercise in dream and visual composition than story to be told. It is a glimpse into the mind of a genius auteur, one who leads us through, showing only what he wants us to see, without rhyme or reason to anyone but himself. But oh what a ride it is. Never on sure footing, scenes not only cut quickly between the decades, but at times possibly in the same frame. I don’t know how many times I believed to know how many people were in the frame only to watch the camera pan left or right to uncover even more. Sometimes these characters are not even really there, talking in one instance and gone the next, all in one take. In this regard, the craft and technique used is very impressive. A moment inside the charred and decrepit remains of a house—possibly the burning barn—as it slowly falls apart while Terekhova washes her hair in a water-filled basin is gorgeous to behold and a later scene with the same actress suspended over a bed is magnificent. So many images have stuck with me for their artistry and ability to confound. There is so much pain, multiple characters at multiple times are seen in close-up with tear-streaked faces, yet so much joy and happiness as well. We are allowed to view the bad times ahead while also catching a glimpse of the hope for the future before it all went south. And just when you think you may have a handle on what’s happening, we are shown a very short moment of a man on a bed, supposedly dying with his mother at his side, played by Tarkovsky’s own mother Maria Vishnyakova. We hear that the man is Aleksei, but then who is this older woman? And why do we see her again in the next scene walking with the young children Terekhova was accompanying at the beginning? Could it be that this is the real mother of Aleksei and the entire film has just been a series of memories he has while dying? So much can be inferred with this piece of cinematic wonderment, so much can be dissected and reassembled over and over again without ever really understanding what is going on. I personally have no clue what it all means, or if it necessarily needs a meaning. Couldn’t Tarkovsky just have wanted to put to film the thoughts running through his mind as mortality was setting in? And if so, would that be a bad thing? I don’t think it would at all. I’m sure a film studies class could fill a whole semester picking The Mirror apart and finding meaning in it, but, when all is said and done, perhaps there is no hidden agenda beneath the surface. 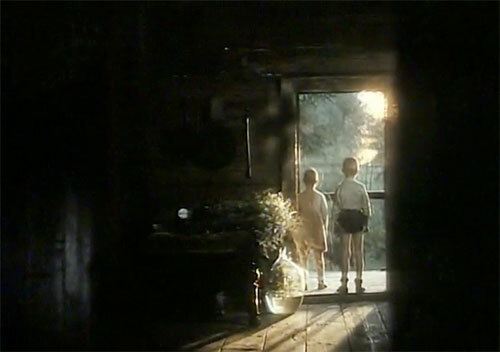 Maybe what we see is what we get, Tarkovsky’s mind unraveled and spliced together, a journey through the landscape of memory, equally mesmerizing and difficult to experience.